Eden Mill is launching its first single malts since distilling began at the Fife brewery and distillery in 2014. The distillery in Guardbridge, St Andrews, has created seven single malts using various mashbills and casks for its new Hip Flask Series. The seven small batch expressions, available in 20cl bottles at 47% abv, feature a combination of pale, chocolate, brown and crystal malt, and have been matured in virgin oak octaves (50 litres) and PX or oloroso Sherry hogsheads. Just 3,800 bottles are available, priced at £25 each. 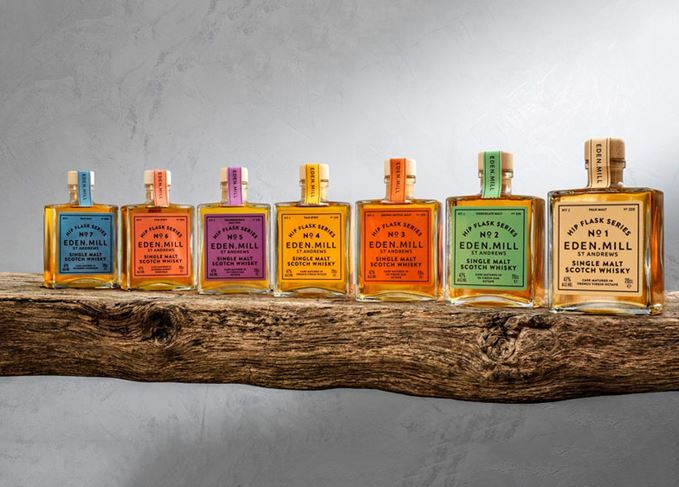 Paul Miller, co-founder of Eden Mill, said: ‘Each expression in the Hip Flask Series contains liquid matured in what we call ‘honey casks’ – first-fill and virgin oak casks that we’ve hand-selected from all around the world, from Speyside to Spain. ‘As each cask only holds a small amount of liquid, releasing smaller bottles of each is a way for as many whisky fans as possible to discover a taste of what’s to come. Additional expressions in the series will be released in the coming months, including peated, Port and wine cask-matured bottlings. The Hip Flask Series has been launched alongside a special edition single malt bottling for staff and members of the Eden Mill Cask Club, while a 2018 Limited Edition Single Malt will be released later this summer for the general public. Those purchasing a bottle from the Hip Flask Series will be given the opportunity to be among the first to join the waiting list to acquire a bottle. The Eden Mill 2018 Limited Edition, which will be available for £75, has been distilled from a pale malt mash and matured in a combination of Bourbon barrels and PX and oloroso Sherry hogsheads. It will be bottled at 47% abv. Scott Ferguson, head distiller at Eden Mill, said: ‘We’re just waiting for the Bourbon casks to come of age in July before we can release our 2018 single malt,’ he said. The announcement of Eden Mill’s first single malt releases follows news earlier this year of a £4 million investment in expanding the distillery into new premises metres away from the current site in Guardbridge. Seggie was a single malt and grain distillery once operated by the famous Haig family, which closed in 1860. Today the St Andrews region is also home to Kingsbarns distillery, a single malt site owned by the family behind Wemyss Malts.